If your workplace offers paid volunteering or you are part of a team who want to help a good cause, then we’d love to talk to you! This page is a guide to how our team volunteering days work and what you’d be doing. You can also download our Team Volunteering Brochure. 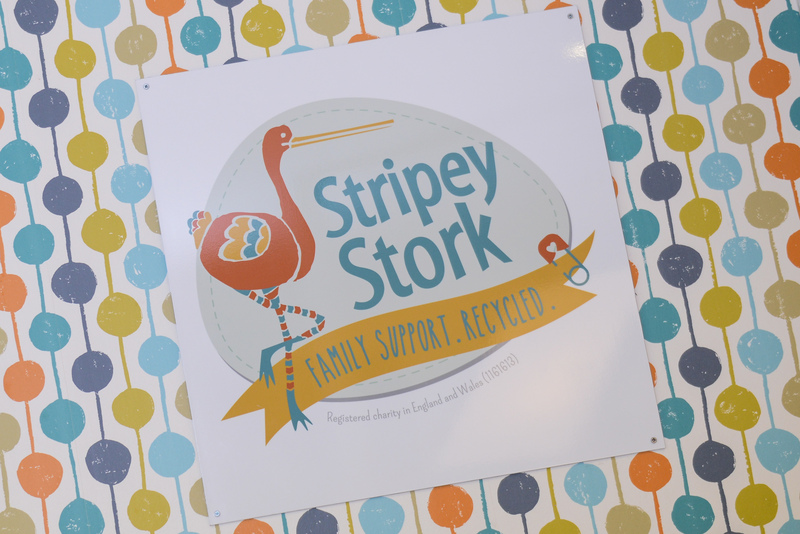 All year round, Stripey Stork gather donations of new and pre-loved items of clothing and equipment for families. The local community donates the items at “donation station” events, and our core team of volunteers then safety check and sort the items. We often need additional help with this task and that’s where a hard working team of volunteers comes in! You can make a huge difference to our ability to respond quickly and cost-effectively to the needs of the referral families. Our corporate volunteer days are designed to be rewarding and fun, with tasks for everyone. You’ll get an immense sense of achievement from taking part. 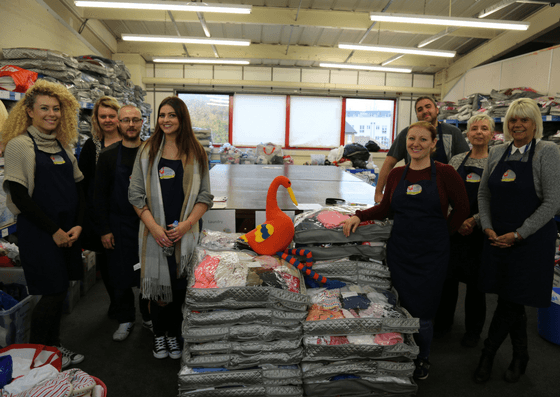 Past participants tell us that our warehouse days are a strong team bonding experience, as well as a chance for team members to demonstrate leadership and improve organisational, communication and problem- solving skills. 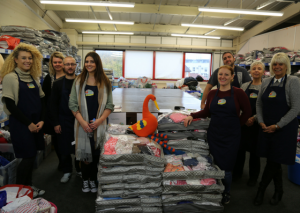 Read our guest blog by a volunteer from Fidelity who felt inspired to tell all about her day at Stripey Stork – The Gift that Keeps on Giving. “This was probably the best charity day I’ve done & I’d happily return in the future and encourage others to do so. A very focused and worthwhile charity. What stood out was that they were clearly used to organising volunteers so had plenty of tasks lined up to make the best use of everyone’s time. 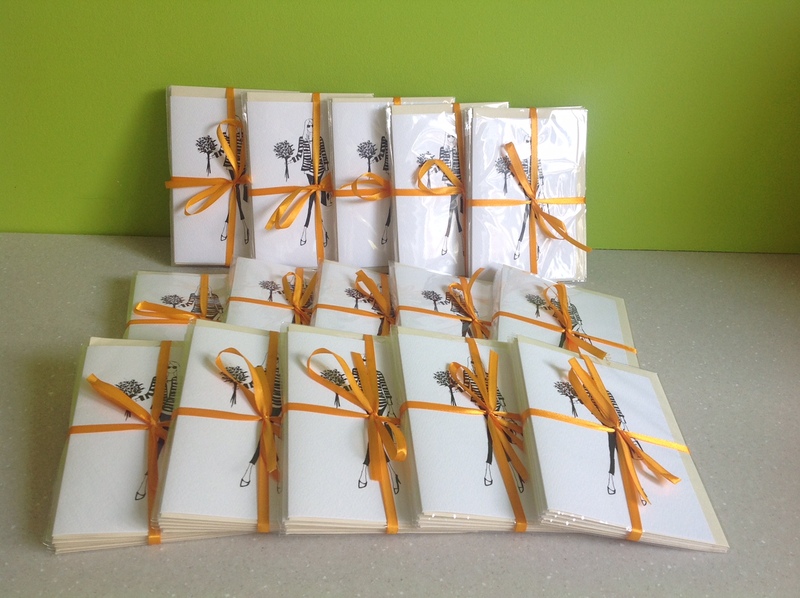 There was also plenty of variety in the tasks we undertook.” – Reed Business Information Ltd.
Do follow us on Facebook and Twitter to get a good sense of what we do and who we work with. Tasks vary from team to team and on the current outstanding work list on the date. Example challenges might include sorting clothes by age or gender suitability, making up clothing packs or new baby packs. 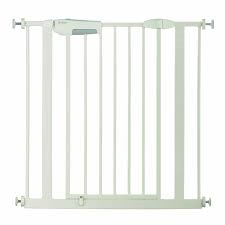 You may be testing toys and puzzles or making sure that a donated pram meets safety standards. Your team will be given responsibility for managing how you approach and complete the tasks. Some groups like to split into teams and see who achieves the most. We’ve had some great teams so far from Grant Thornton International, Allianz, Bailhache Linton, Pfizer, IHS Markit, Canon, Voluntary Action Reigate & Banstead. If you’d prefer to put your professional skills to use in a different environment we’d also be very interested in hearing from you. As an example, we’ve had the Canon HR team helping us develop policies for new employees, and the Grant Thornton International communications team helping us plan our strategy for a seasonal campaign. You’ll be up on your feet but there are tasks for everyone. We’ll ask you to read and sign our manual handling guidance before arriving, and you can let us know on arrival if you think you’ll have any issues. Our offices are on the first floor and there isn’t a lift so please bear that in mind. Unlike other charities, there is no charge for a team to take part in our volunteer days. 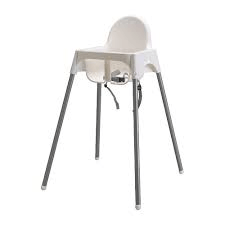 However, most participating companies choose to donate products such as nappies or wipes as part of a team collection with a value of £10 per person. Another way to help would be to purchase our “Proud Couture” greeting cards, available at the office at £10 per pack of 5. Where does the volunteering take place? 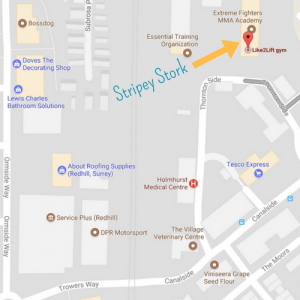 At the Stripey Stork office, Trafford Building, Quarryside Business Park, Thornton Side, Redhill, RH1 2LJ. Between 6 and 10 people works best. Other group sizes by arrangement. What time are we needed? Standard team sessions are from 9:30am – 2pm. Other times by arrangement. Volunteering with us is a good chance to escape the office, and as such you’ll be on your feet for much of the time, so make sure you wear comfortable clothes and shoes. Layering your clothes is a good idea as temperature will depend on time of year and what task you are allocated. We’ll provide a Stripey Stork apron so you feel a part of the team! 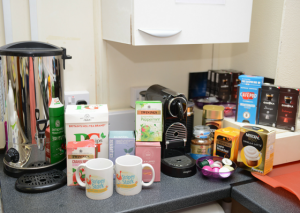 We’re well stocked with tea and coffee and you can help yourself throughout the day. If you’d like to buy lunch you can go to Tesco Express which is a 1 minute walk from the office, or we can advise you of which local delis deliver platters, if you’d like to organise lunch in advance. This covers the questions that most corporate groups have, but if you’d like to ask anything else, please email volunteer@stripeystork.org.uk. 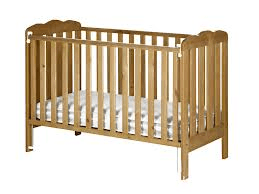 We look forward to welcoming you and your team to #TeamStork soon. You can download our Team Volunteering Brochure, which provides all the information you will need to present this idea to your team.